lower right: D.M.BUNKER / 1889. Perry Rathbone, New York; purchased 1972 by Raymond J. [d. 2005] and Margaret [d. 2005] Horowitz, New York; bequest 2007 to NGA. American Impressionist and Realist Paintings and Drawings from the Collection of Mr. & Mrs. Raymond J. Horowitz, The Metropolitan Museum of Art, New York, 1973, no. 13, repro. Loan to display with permanent collection, The White House, Washington, D.C., 1977. Loan to display with permanent collection, National Gallery of Art, Washington, D.C., 1985. 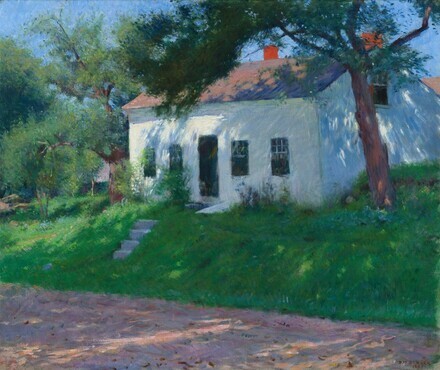 The Bostonians: Painters of an Elegant Age, 1870-1930, Museum of Fine Arts, Boston; Denver Art Museum; Terra Museum of American Art, Evanston, 1986-1987, no. 26, repro. Loan to display with permanent collection, The Metropolitan Museum of Art, New York, 1988-1992. Dennis Miller Bunker: American Impressionist, Museum of Fine Arts, Boston; Terra Museum of American Art, Evanston; Denver Art Museum, 1995, no. 37, repro. (shown only in Boston). American Impressionism and Realism: The Margaret and Raymond Horowitz Collection, National Gallery of Art, Washington, D.C., 1999, no. 11, repro. American Impressionism: A New Vision, 1880-1900, Musée des impressionnismes Giverny, Giverny; National Galleries of Scotland, Edinburgh; Museo Thyssen-Bornemisza, Madrid, 2014 - 2015, no. p. 102.